Red Sox top prospect Xander Bogaerts has been promoted to Triple-A Pawtucket, the PawSox announced on their Facebook page. The move was later confirmed by WEEI's Alex Speier. Bogaerts will be in tonight's lineup when Pawtucket takes on the Buffalo Bisons at McCoy (weather permitting). Bogaerts, 20, batted .311/.407/.502 with six home runs, six triples and twelve doubles in 56 games in Double-A Portland this season. As incredible as he's been the last couple of weeks, Bogaerts initially struggled this season, batting .245/.286/.283 with 16 strikeouts to three walks in his first 12 games of the season. He found his rhythm at the plate, hitting .331/.441/.572 in his subsequent 44 games. Bogaerts displayed an improvement in his plate discipline this season as he walked 35 times in 259 plate appearances, a remarkable turn around from his one walk in 92 plate appearances last season with Portland. He batted .315/.392/.531 in 351 Double-A plate appearances over two seasons, both while playing as the youngest player in the league. 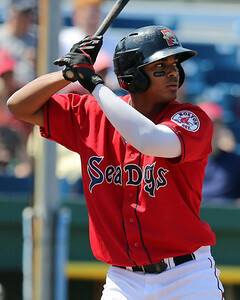 Bogaerts will be the youngest player in Triple-A. A corresponding countermove for Bogaerts will be made.